OWEC Tower is a technology company offering design solutions for offshore substructures in the renewable energy sector. Through world-leading technology and special offshore wind foundations competence, ISO 9001-certified OWEC Tower maintains a wide and experienced network, including yards, contractors and installation companies. Established in Bergen in 2004, OWEC Tower has installed 88 foundations, which equates to installed power of 484MW. OWEC Tower’s main product is the OWEC Quattropod®, a complete wind turbine substructure, which includes a transition piece and jacket foundation. It is especially suitable for larger turbines, deeper water and demanding soil conditions. The innovative design of OWEC Quattropod® is based on 40 years of offshore structural design experience. OWEC Quattropod® is the only wind turbine jacket foundation designed, certified and installed offshore, and the only proven substructure with pre-installed piles. The substructure was recently deployed at the Ormonde Offshore Wind Farm project, with 30 foundations installed in the Irish Sea; and Thornton Bank Phase II, with 48 units and 1 Offshore Transformer Station situated in Belgian waters. This wind turbine substructure is fabrication friendly and proven for serial production. It is designed for efficient installation and has remarkable adaptability to different concepts such as suction buckets, gravity based and drilled piles. In addition, the substructure is focused on interfaces, including wind turbine, manufacturing and installation requirements. OWEC Tower has a comprehensive study portfolio and can offer studies for different wind turbine types, including the largest turbines (up to 10MW). OWEC Tower has worked on many high-profile wind farm projects and studies, including Beatrice in Scotland, alpha ventus in Germany, Ormond in the UK,Thornton Bank II in Belgium and Le Carnet in France. OWEC Tower has worked on projects for: A2Sea, Alstom, Burntisland Fabrications (‘BiFab’), DEME, Deepwater Wind, GE, Hochtief, Iberdrola, Innovent, MT Højgaard, Norsk Hydro, NorWind, Norther, ODE, Poweo, REpower, RWE, Smulders, Statkraft, STX, Talisman, Tecnova, Vattenfall, Vestas, Havsul, WPD, Samsung. OWEC Tower has experience of working on demo and test sites for offshore wind projects. In 2011, the company designed a jacket foundation for the Haliade 150-6MW wind turbine from Alstom in Le Carnet, France, and showed its ability to simplify the design process as much as possible to suit the project schedule. However, OWEC Tower was still able to provide innovation on the midsection of the prototype to avoid the use of expensive fabrication items with long lead times, such as castings. 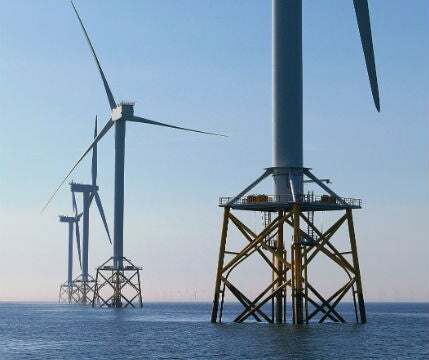 The Beatrice Wind Farm Demonstrator Project for Talisman and SSE included the first jacket-based design installed in offshore wind. After a comprehensive screening/FEED study Beatrice was originally planned with tripods but OWEC Quattropod® was chosen late in the project.The water depth of 45m was a record together with the wind turbine size, the REpower 5MW. It is predicted that offshore wind farms have the potential to generate up to five times the present global electricity production. With stronger and more stable wind resources, offshore wind farms can be operated in large, open areas, with no noise restrictions, utilising larger wind turbine generators, typically up to 10MW, to produce more energy. OWEC Tower is a dedicated and experienced offshore wind partner with interface understanding and strong network based on hands-on experience. With a deep awareness of the supply chain for offshore wind, OWEC Tower’s design and experience helps to reduce offshore wind project costs. OWEC Tower has provided design solutions for offshore substructures in line with certification processes, including DNV, GL and BSH. OWEC Tower is supported by strong financial industry owners, including Keppel Ventus BV, which is a large shareholder. This strength allows for further development of our company, access to a wider network of engineering capacity and a broader capability to handle projects of any size.